What are the signs of alcohol addiction? Are there any? Yes. Whether it is you or a loved one suffering from Alcoholism, the signs of alcohol addiction are there. They may be harder to read in some people, but they are there nevertheless. Alcohol addiction can lead to a loss of control. People over-indulge and find themselves stumbling around or speaking incoherently, losing control of their physical and mental abilities such as walking, thought process and speech. Another sign is the craving. Do you find yourself “needing” alcohol? Meaning, do you desire alcohol at different times of the day, specifically wanting a drink versus being hungry or wanting to see someone or getting something done. The only thing going through your mind is you need a drink. That is a significant sign of alcohol addiction. Do you tend to turn to alcohol more and more to forget your problems? You could be stress over something at work; you may be arguing with your spouse, whatever the reason, you just want a drink so you can forget about your day; your week; your life, for a brief moment in time. Perhaps you are in denial about the alcohol addiction. If so, let’s look at some questions. Now, answer them honestly to yourself, okay? After that, you can decide if you have an alcohol addiction. Look at that credit card bill or that bank balance for the month. How much money did you spend on alcohol? Seriously, when you began grumbling to your wife that you don’t know where all the money went as she is paying bills, how did you feel when she showed you a $200 bill for vodka for a two week period and $400 for beer for the month? You can’t blame her because she isn’t a drinker so who does that leave? Did you call in sick on Monday again even though you aren’t? Friends call or come by, and you are in the bedroom. Your wife tells everyone you are in bed sick, but the truth is, you are drinking, or you have a horrible hangover. We can’t tell anyone, though, because you could lose your job, so it is a secret. Now think back. Are a couple of your friends a little upset with you at the moment and you cannot understand why? They mentioned something about how you behaved when you were drinking. You tell yourself it is impossible, though, because if it was that bad you would have remembered, right? Wrong. 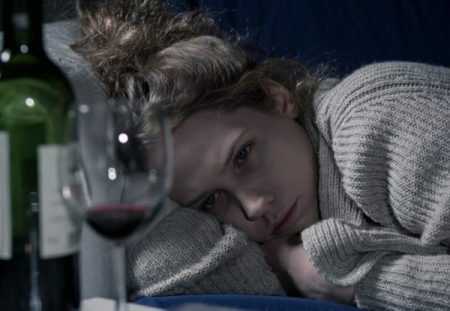 If these questions are hitting uncomfortably close to home, then you need to face the fact that they are signs that you do have an alcohol addiction. Now, sit down and tell your wife she was right and let’s get you the help that you and your family deserve.